“Comfort and discomfort are pretty broad terms. Each viewer will arrive with their own comfort/discomfort levels. The artist makes something to react to…the viewer reacts”. “The space has a huge effect on the works. With sculpture the space creates a tangible context. You can’t really predict it; you have to work with it. There are always surprises”. May encounter the works in permanent collections or curated exhibitions. Are drawn into a unique perceptual experience. 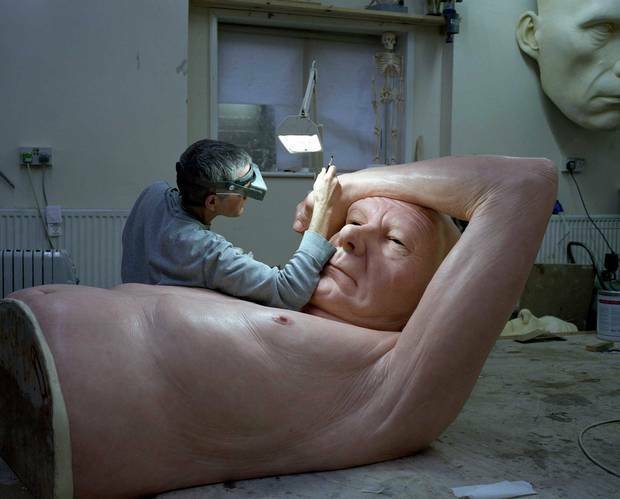 Are able to access other levels of content and context via documentaries on Mueck’s practice. Subjects are often friends or relatives. Prior to the ‘Sensation Exhibition’ at the London Royal Academy of Arts, Mueck had only one previous exhibition at Hayward Gallery. Mueck’s inclusion in the StatuePhilia exhibition at the British Museum (2008-2009) is evidence of his status as a major artist, which affects the way in which his work is presented in museums and galleries, determines the cultural status of those institutions (Mueck’s work is shown in National Galleries, not local shopfronts), and so inevitably influences the way in which both critics and the general public approach the work. These are peopled by the everyday, old men and women, clothed and unclothed, disenfranchised or alienated youth, pregnant women, women giving birth, children, infants etc, represented on a scale that takes the viewer outside the confines of their daily experience. How is our view of the work socially / culturally conditioned? What role does the media play in conditioning responses to the work? But does it float? A popular question during the notorious ‘Witch Hunt’s’ and ‘Inquisition”. What’s the relevance here? Not everything fits into this Board determined ‘frame’, neither can you make it. Mueck’s work neither appropriates, parodies, quotes or displays any of the other derivatives associated with Postmodernism. His earliest works were made in the mid ’90’s, at a time when Post Modernity was breathing its last. Mueck’s practice is rooted in tradition. Despite the use of fiberglass, silicone and resins etc, which, whilst being material considerations that facilitate his painstaking attention to detail, its his surface treatment; which derives its strength from a deep understanding of traditional painting technique and his ability to bring realism to form that set his works apart. Post Modernism as a stream of art practice was embraced by some but not all practitioners of the time. Mueck’s work arguably slides comfortably into this context. You could possibly construct a scenario and argue for it but my advice would be to refrain from referencing Mueck in a Post Modern context unless you’re exploring readings of the work through a ‘structuralist’ or ‘semiotic’ lens.